BATMAN together with his ultimate archenemy, the JOKER! Includes special edition guide book and TWO collectible 5.5" VINYL FIGURINES! 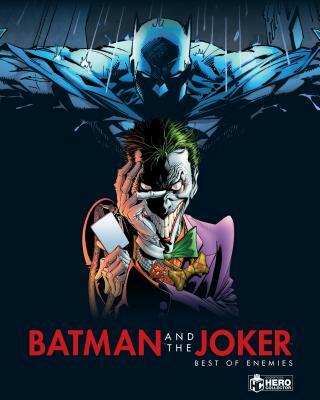 Explore the twisted and tangled relationship between Batman and the Joker through character profiles, tales from Gotham City, examine their greatest stories and the publishing history of these best-of-enemies through 75 years of history - from the Golden Age of comics to the Modern Age. Included with this set are two masterfully sculpted 1:14 scale vinyl figurines of the Dark Knight and the Joker! A glimpse into the twisted and tangled relationship between Batman and the Joker, packaged with special vinyl figurines of Batman and The Joker. Nick Abadzis has been creating books, magazines, comics and stories for both adults and children for nearly thirty years. As both cartoonist and writer, he's been honored with various international storytelling awards including an Eisner in 2008 for his graphic novel Laika. He has collaborated with clients such as EY, KPMG, Accenture, Coca-Cola, Hewlett Packard Enterprise, IBM, General Electric, WOBI and many others. Nick's been published in the USA by Condé Nast, First Second, Marvel Comics, Titan Comics, DC Comics; in the UK by the BBC, various national newspapers including The Guardian, The Times, and The Independent, and many other periodicals too numerous to mention; elsewhere in Europe by the likes of Dargaud and Glénat; and in Japan by Kodansha. He is also known to Doctor Who fandom as the writer of a great many tenth Doctor (David Tennant) adventures on an acclaimed run of stories for Titan Comics. He is British but based in and around New York City where he lives with his wife and daughter.